Kari Vehosalo has been awarded with the prestigious Finnish art prize Ars Fennica 2017. The winner was chosen by curator Beatrix Ruf. "With my intense encounters with the shortlisted artists for the 2017 Ars Fennica prize – Maija Blåfield, Pekka and Teija Isorättyä, Perttu Saksa, Kari Vehosalo and Camilla Vuorenmaa – still fresh in my mind, I must emphasize the impressively high quality of their artistic projects and the installations and displays at the Kiasma Museum. Making the decision to give the award to one particular artist was not easy, especially considering the power of the exhibition as a whole and the interplay of the artists’ works in it. Images and materials decompose meaning, the production of images turns into a disconcerting, unsettling, infected and sterile appearance – and our aesthetic, as well as philosophical certainties, bounce off disingenuous beauty." The candidates for the 2017 Ars Fennica Award are Maija Blåfield, Pekka & Teija Isorättyä, Perttu Saksa, Kari Vehosalo and Camilla Vuorenmaa. A joint exhibition of their work will be presented at Helsinki’s Museum of Contemporary Art Kiasma from October 13, 2017 to February 2, 2018. A related web publication will be released in conjunction with the exhibition. The Ars Fennica Award is valued at €40,000. The winner will be chosen by Beatrix Ruf, the Director of Stedelijk Museum Amsterdam. The Heino Art Foundation has one of Finland’s foremost collections of contemporary art. The foundation was established to promote art and safeguard the collection built over several decades by Raimo and Raini Heino and their son, the gallerist Rauli Heino. The collection has 1416 works of art by 223 artists. They include paintings, sculptures, drawings, photographs and moving images. The works date from the 1950s to the present. All the artworks in the collection have been selected by the Heinos themselves, based on their common preferences and passion for art. From Heino with Love offers the first glimpse of the foundation’s extensive collection. The exhibition highlights the topical nature of the collection and includes important works by contemporary Finnish artists. The large works in the collection find the space they need in the arched galleries of the Tennis Palace and the public has an opportunity to see an overview of contemporary Finnish artists. A total of 100 works of art will be included in the exhibition: paintings, photographs, drawings and sculptures. From Heino with Love has been curated by HAM curators Mikko Oranen and Jari Björklöv. The exhibition is organised in collaboration with the Heino Art Foundation. The art museums of Lahti and Rovaniemi invited all artists residing in Finland to participate in Draw Now! exhibition, which shows every aspect of contemporary drawing. Drawing is a major form of expression within the visual arts, prominent in everyday life. Draw Now! exhibition shows all forms contemporary drawing can take, from artistic drawing to animation, performance, or something hitherto unknown. 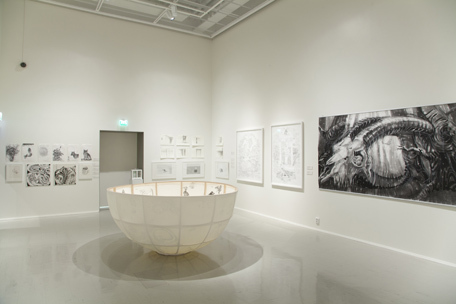 This is the largest exhibition of contemporary drawing in Finland this far. Over 300 artists submitted 840 works of art to the exhibition, ranging from sculptors and painters to cartoonists and graphic designers. 101 works from 55 artists were selected for this exhibition by a three-person jury, representing a large variety of media and styles. The jury consisted of cartoonist Hanneriina Moisseinen (nominated by the Lahti Artists´ Association), visual artist Jaakko Rönkkö (nominated by the The Association of Finnish Printmakers), and amanuensis Maija-Riitta Kallio in the Lahti Art Museum. The exhibition is organized by Lahti Art Museum, Rovaniemi Art Museum, Lahti Artists' Society and The Association of Finnish Printmakers. Outi Aho, Tomi Dufva, Bo Haglund, Marjatta Hanhijoki, Iina Heiskanen, Anni Henriksson, Ylva Holländer, Antti Immonen, Rozalia Janovic, Juha Joro, Nikki Jääskeläinen, Iida Kauppinen, Kaisu Koivisto, Outi Koivisto, Pete Koivunen, Piia Kokkarinen, Hanne Kontiola , Sami Korkiakoski, Sini Kosonen, Kirsi Kukkurainen, Reijo Kärkkäinen, Anne Lehtelä, Tiina Lehtimäki, Ulla Liuhala , Satu Loukkola, Sonja Löfgren, Elisa Matikainen, Inka Matilainen, Aaro Matinlauri, Salla Myllylä, Liina Mäki-Patola, Anna Mäkelä, Pauliina Mäkelä, Jenni Niskala, Janne Nytorp, Pilvi Ojala, Timo Partanen, Okko Pöyliö, Petri Reinikainen, Veronika Ringbom, Tuomo Rosenlund, Vappu Rossi, Katri Sipiläinen, Anna Tahkola, Taitelijaryhmä Hyäryllistä, Leila Tanskanen, Eeva Tiisala, Anu Tuominen, Tatu Tuominen, Seija Ulkuniemi, Matti Vainio, Kari Vehosalo & Anne Törmä, Tuuli-Anna Viitanen, Hanna Westerberg. Group exhibition with Tuomo Nevalainen, Kari Vehosalo and Matti Vainio. Kari Vehosalo is known for clinically observed paintings that investigate the power structures of reality and the inner conflicts of human nature. In his most recent paintings and sculptures, threatening and unpredictable nature becomes part of tragicomic human existence in which our lot is to be cast into an environment that rejects us. The exhibition follows the common thread running through Vehosalo’s entire production: depiction of the pressures that builds up between the contradictoriness of human nature and the private as well as shared social reality. The title Terrible Nature comes from the philosophy of Thomas Hobbes (1588–1679), in which humanity is alienated from nature by the social contract. For Hobbes, nature represents anarchy, continuous war and something that we can overcome by relinquishing our freedom to a sovereign power. In Vehosalo’s art, nature is present both as concrete, depicted nature as well as a metaphor of the inner essence of humanity, our way of being and possessing. Observing the autopsy of our existence performed by Vehosalo with the detachment and precision of a surgeon, attention is drawn not only to his sovereign technical control, but also his skill of imbuing the works with a charged, passive-aggressive sense of alienation. Pushing the boundaries of unpleasantness, the works are unheimlich, subconsciously familiar yet simultaneously alien, and thereby both terrifying and exciting. Kari Vehosalo (b. 1982) lives and works in Helsinki. He graduated from the Institute of Fine Art at Lahti University of Applied Sciences in 2008, and earned a Master of Arts degree from Aalto University in 2010. In addition to painting, he also works with photography and assemblage. His works can be found in several private and public collections, including Kiasma, Helsinki Art Museum, Sara Hildén Art Museum, Amos Anderson Art Museum, and the Saastamoinen Foundation Collection. The summer exhibition presents works from the Sara Hildén Foundation collection ranging from classic works to new acquisitions representing contemporary art. The upper floor of the museum houses classics of European modernism and early pre-war masters. They represent the movements in modern art of the early twentieth century from post impressionism to cubism and surrealism. Among the artists represented are Pierre Bonnard, Juan Gris, Paul Klee, Fernand Léger and Pablo Picasso together with masters of modern art of a younger generation such as Paul Delvaux, Joan Miró and Giorgio Morandi. Paul Delvaux’s Summer was Sara Hildén’s own favourite work. Other major works in the collection include the British sculptor Henry Moore’s Reclining Mother and Child and Alberto Giacometti's female figure Woman on a Chariot. Also on show at the exhibition is a new donation from the German sculptor Thomas Schütte, 18 etchings from the Frauen series. ”Non-figurative” is one common denominator of the collection’s post-war works. Informalism, which emphasized the artist's freedom of expression, was the predominant movement in European art in the 1960s. Among its main exponents were Rafael Canogar, Jean Dubuffet, Hans Hartung, Pierre Soulages, Antoni Tàpies and Zao Wou-Ki, whose works are on show in this exhibition. Jason Martin’s painting Waltz of the Toreadors(2012) constitutes a continuum to these works. Francis Bacon's study for a portrait of his life partner George Dyer, which has been exhibited in numerous art museums around the world, is one of the internationally best-known works in the collection of the foundation.Rebirth, an installation by Edward Kienholtz, who was a representative of 1970s neo-realism, and Mysteriously Yours, a collage by the pop artist Martial Raysse are likewise both among the most iconic works of the collection. 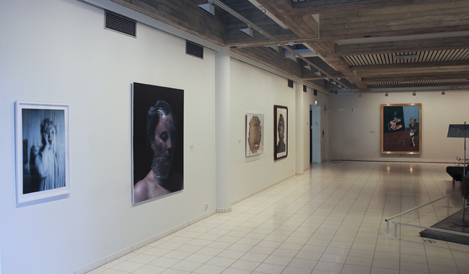 Alongside them you can see Kari Vehosalo’s painting Picture of Dorian Gray (2013). Downstairs in the museum we present new acquisitions from the German artist Berta Fischer, the Swedish painter Andreas Eriksson and the Finnish artists Tor Arne, Tomas Byström, Markus Konttinen, Leena Luostarinen, Jussi Niva, Pasi Karjula and Antti Tanttu. The collection of the Sara Hildén Foundation is one of the largest and most important assemblages of modern and contemporary art in Finland. The foundation continuously updates the collection, and its works are housed in the Sara Hildén Art Museum, which is maintained by the City of Tampere. At the present time, the number of works in the collection of the Sara Hildén Foundation amounts to almost 5000. Kari Vehosalo (born 1982) is a philosopher and a craftsman. His works address power, its essence and structures, and how even unconsciously the social contract steers and restricts our way of being. Polite behaviour is usually a ritual devoid of content, but nonetheless required in order to pass as a human being. Vehosalo thus takes as his theme the psychopathology of everyday life. Caring, death, pleasure, humiliation and pain are hidden in his work and become flesh in the viewer’s experience. Vehosalo is an artist who not only thinks thoroughly and precisely but also paints with extreme consideration and care and by taking his time. His oil paintings are constructed slowly, in thin layers. He often works in a grey scale, which, however, is by no means “colourless”, and even when he does use colours so that you immediately notice them, they are carefully chosen and considered. There is nothing random about Vehosalo’s paintings, just as he appears to think that there is nothing random about reality either. Works by Kari Vehosalo are in the collections of the Kiasma Museum of Contemporary Art, the Sara Hildén Art Museum, and the Helsinki Art Museum. 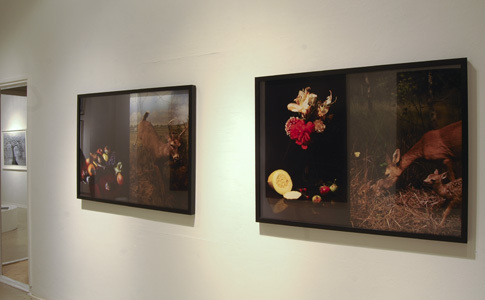 Works from the collection of Sara Hildén Art Museum. 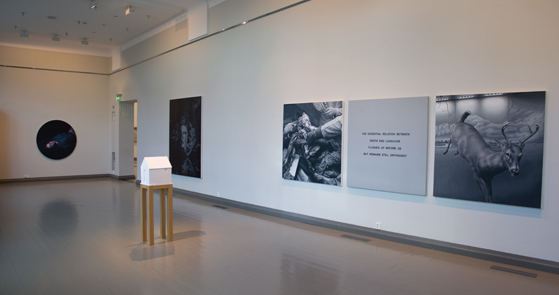 Works from artist: Eggert Pétursson, Ross Bleckner, Mark Francis ja Marc Swanson, Jaakko Himanen, Veikko Hirvimäki, Arto Korhonen, Jarmo Mäkilä, Leena Nio, Tamara Piilola, Stiina Saaristo, Osmo Rauhala, Kari Vehosalo and many others. Drawing in the Flesh goes deep into Finnish art of drawing from the perspectives of contemporary art and art history. by students of Lahti University of Applied Sciences' Institute of Design and Fine Arts and by students of Aalto University School of Arts, Design and Architecture. The exhibition outlines the history of drawing with the help of, among other things, Finnish 19thcentury artists' drafts, caricatures, and hand-drawn maps. 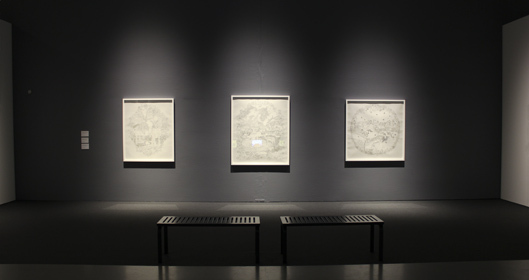 The exhibition Drawing in the Flesh is complemented by mini exhibitions of drawings with different themes, taken from Vantaa Art Museum's collections. Vantaa Art Museum's curator Päivi Rainio. Works from Kiasma collection Documents are associated with assumptions of truth, authenticity and originality, yet a document is not self-evidently true.Documents are susceptible to manipulation, and archives are always the result of historical choices.The work of many artists is characterised by a critical attitude towards authenticity and originality. The exhibition consists mostly of works from the collections of Kiasma, featuring both recently acquired pieces and some that are on loan.We hope that the exhibition will inspire visitors to reflect upon their own attitudes towards documents, memory and historical events. Many contemporary artists work in ways that have a similarity to the documentary method, capturing elements of reality in their work.Others use archive materials in their art.The documentary appearance of an artwork can also be a carefully constructed impression – documents are not self-evidently true. The group exhibition “Figuration Y ?” intends to question the esthetic of figurative painting developped on both sides of the Atlantic by a new generation of artists part of the so-called Generation Y. Favardin & de Verneuil chose to exhibit and confront the American painters along with German and Finnish ones, Shay Kun, Erik Sandberg, Sebastian Schrader, Kari Vehosalo and Jason Yarmosky. Generation Y, also known as the Millenial Generation, is the demographic cohort that follows the Generation X. With birth dates often ranging from the mid-1970s to the late 1980s, this generation has transcended the ideological battles bred by the counterculture of the 1960s and usually rejects the attitude of the baby boomers. Usually described as “civic minded”, they often enjoy the same music, movies and products as their parents. Despite their use of new technologies and computers, in a 500-channel TV universe, at higher rates than any other generations before, those artists set themselves apart from the past by coming back into the great tradition of painting and figuration. Favoring a return of History with a big H and great narratives, they mix innocent dayly life elements found in video games, cartoons, television, fashion or advertising with History icons, mythologies and great historic moments. But if the context is very similar, this exhibition strives to stress the esthetic differences between those American and Northern European artists. Groupshow with seven former students of Lahti University of Applied Sciences, Institute of fine Arts. Maria Laine, Kari Vehosalo, Jukka Lehtinen, Outi Kirves, Anssi Kasitonni, Tapani Mikkonen, Kalle Hamm. Galerie Anhava continues its 20th-anniversary celebrations by presenting a number of interesting young artists:Jenni Eskola (born1982) draws copies of the same picture again and again, or fills the surface of the image with numerous loop designs. Meticulous repetition, starting from scratch each time, is a recurring theme in Eskola's work. For the artist, repetition is an event that in its termination always returns to its starting point. Time is one of the main materials of her works, for the series that is produced as a result requires, without exception, long-term concentration. Despite the precision of her work, Eskola is interested in the minute details that distinguish mechanical replication from unique work. Eskola will display at Galerie Anhava a series of drawings, each of which corresponds to one day. The empty white part of each of these "light drawings" is defined by the amount of daylight. In the Studio at Galerie Anhava, the turning points of the seasons, such as the spring equinox, are in the four corners of the room. The time of the exhibition, the month of November, forms a pause in the artwork, being placed in the doorway, an empty part of the room. Also on display will be Eskola's video piece entitled Loop. Joseph James (born 1979) is an artist born in the United States and residing in Finland. His medium is paper cutting with drawings cut out of their background, leaving a cobweb-like design, line separated from paper. James combines an unrestrained style of drawing and the relaxed mark of his hand with precise cutting, merging the expressiveness of drawing with the delicateness of the final work. While his works may derive from figurative subjects, they are reduced to an almost abstract state. Occasionally, they emphasize the movement of drawing and there is no figurative starting point. Partly assembled in layers and mounted with ample space, the artist's works create the illusion of designs drawn in the air that defy gravity. The Icelandic artist Egill Sæbjörnsson (born 1973), who currently resides in Berlin, combines installation, video, performance and animation. His works on display at Galerie Anhava mostly consist of quite average, everyday objects, such as chicken netting and plastic buckets. Kugeln is composed of cleaning equipment. The nature of the objects, however, changes when the artist projects rays of light, designs and colours on them, creating a scene for them. In a dark space, the silhouettes and reflections of the objects on the walls transform composed still-lifes of everyday items into small dramas. Sæbjörnsson is also a musician, and sound, occasionally live performances, often play an important role in his works. Kari Vehosalo's (born 1982) paintings combine realistic, photographically accurate portrayal with the unreal nature of the depicted events. References to past decades and black and white work distance the images into their own reality. At the same time, these nostalgic, richly detailed paintings of accomplished technique appeal to the viewer. Viewing them, however, involved a contradiction. The situation becomes uncomfortable when attention is drawn in the paintings to occasionally distasteful events or moments that are felt to be embarrassing. Strangeness overturns the viewing situation. The exhibition features new paintings from the artist's series Fear of Violent Death. The next exhibition of Favardin & de Verneuil wants to bare witness to this renewed interest of the emerging art scene for figurative painting. Following their will to promote artists little-exposed in France, the gallery will present Joe Becker (Canadian), Jarmo Mäkilä (Finnish), David O’Kane (Irish), Eamon O’Kane (Irish), Axel Pahlavi (Iranian), Sebastian Schrader (German) and Kari Vehosalo (Finnish). The gallery chose this exhibition title to echo one of the key books by Enrique Vila-Matas. Montano’s Malady is described by the author as a literature obsessive sickness affecting a writer obsessed with literature and unable to distinguish between real life and fictional reality. In this sort of intimate diary, calling forth the notion of Doppelgänger, the narrator is embodied in the double form of a critic of literature mixing schizophrenically his inmost thoughts and memories with those of other authors and a writer who can only describe the world through quotations and literary references. Peering into the various contemporary approaches to the medium to find a common denominator to those international artists, the gallery wanted to stress this mise-en-abyme of a literature talking about literature to compare it to this empathy phenomenon shared by many contemporary artists nowadays, in their emotional relationships to the world and to history. Like Montano’s character, these artists embed elements of the past as far as to merge them with their own history. Where the viewer is not called upon to recognize images or styles but to recall. In their practices, the artists presented in this exhibition get close to this psychological process close to empathy. They are nurtured by pre-existing images and shapes inundating contemporary society : photography, movies, TV images, video games, highbrow and pop cultures. But far from a mere collage, quotation or parody, those artists create syncretic works which don’t call for erudition but memory. Didn’t Christian Boltanski confide us recently that an artist cannot represent reality ? He has just to deal with memory, this deteriorated vision, and possibly distorted part of reality. Those traces of memory and the past are founding elements of our Present. Jari Juvonen, Markku Hakuri, Timo Heino, Maija Helasvuo, Mikko Ijäs, Mika Karhu, Peter Maury, Teemu Mäki, Heli Ryhänen, Niina Räty, Ari Saarto, Juha Sääski, Antti Tanttu, Kari Vehosalo, Henry Wuorila-Stenberg and students of the Aalto University. The experience of pain is private, but can it also have a collectively shareable form? The question is explored by a group of acclaimed artists, some of whom are personally familiar with the experience of pain. The exhibition also includes an educational and community art aspect that will be organised in collaboration with pain organisations. Among other things, visitors will have an opportunity to measure the intensity of their own pain. Exhibition about pain, curated by researcher / artist Mika Karhu at Kerava art Museum. A skilfully executed figurative painting is captivating, but also misleading. Things that seem “real” may not actually be real. Instead of imitating, contemporary figurative painting challenges and conceptualises the visible reality. The world often appears mysterious or odd, out of kilter. A “virtually real” painting challenges us to think, to use our imaginations and to interpret the work ourselves. Virtually Real examines the scene of figurative painting in Finland through the work of 12 artists. They are Petri Ala-Maunus, Markus Heikkerö, Juha Hälikkä, Minna Jatkola, Markku Laakso, Sami Lukkarinen, Ville Löppönen, Tiina Mielonen, Paula Ollikainen, Stiina Saaristo, Minna Sjöholm and Kari Vehosalo. The show features works completed in the past 15 years. The very same period in which the Internet, computers, digital photography and digital imaging have become a part of everyday life. They have altered our relationship with pictures and been adopted as tools by an increasing number of artists. Art has always drawn influences from the surrounding world, and other forms of visual culture reciprocally from art. Digital technology has speeded up this exchange of imagery and motifs to an unprecedented degree. Solo exhibition at Art Center Mältinranta, Tampere.